Starring : Bisola Aiyeola, Funke Akindele, Zainab Balogun, Shaffy Bello, Lepacious Bose, Ini Edo, Dakore Egbuson-Akande, Linda Ejiofor, Folarin ‘Falz’ Falana, Mawuli Gavor, Kate Henshaw, Ayo Lijadu, Jude ‘MI’ Abaga, Richard Mofe-Damijo, Beverly Naya, Chinedu ‘Nedu’ Ani, Uti Nwachukwu, Taiwo Obileye, Chioma ‘Chigul’ Omeruah, Rachel Oniga, Beverly Osu, Nkem Owoh, Patience Ozokwor and Joke Silva. Chief Daddy tells the story of billionaire industrialist Chief Beecroft (Taiwo Obileye), a flamboyant benefactor to a large extended family of relatives, household staff and assorted mistresses. Chief lives large, like there’s no tomorrow, until the day he dies suddenly and the ‘bullion van’ stops. What’s in his will and who gets all that money? What happens next will surprise you, as Chief Daddy has the last laugh from beyond the grave. Honestly, I was stunned when I saw the galaxy of stars in Chief Daddy and it got me thinking how difficult the plot of this film was going to be that the guys at Ebony Life gathered so many established names in Nollywood to pull off. However, when the film started, it became apparent to me what the intention of the producers was. Let’s be honest, there isn’t anything funny about the death of a person with people squabbling for the deceased person riches so the best way to make light of a sad event is to rely on the individual talents of the characters/cast to put the funny into it. This is quite an ingenious plan because just like Wedding Parties, funerals are another facet of Nigerian life that has so much drama in them. The cast did a fantastic job in bringing life to their characters. 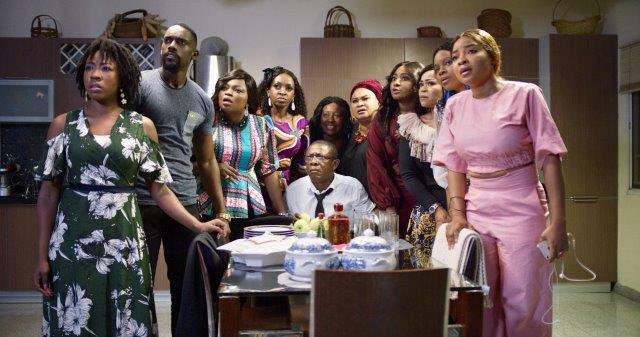 Osuofia and Patience Ozokwor are their usual bickering selves, Nedu is his usual mad self and his chemistry with Chigurl was humorous just like Kate Henshaw and Funke Akindele (Jenifa) also made a humorous pair. Joke Silva showed panache (as always) just as Mawuli Gavor and Beverly Naya oozed of class. Bisola said less than 5 words but her facial expression almost killed one with laughter. I must also single out Falz who is a mad man and must be stopped! That dude is my standout comic in Chief Daddy- make sure to look out for his jam “Who’s Your Daddy?” which would leave you in stitches. Chief Daddy relies extensively on individual talents for laughs but the downside to this is that the plot’s resolution suffered. The plot of Chief Daddy makes commercial sense because just like Wedding Party, it’s very relatable but it is a tricky one to conclude and this challenge reared its head as the producers found it quite difficult to give it an appropriate ending. The conflict resolution is abrupt and rather underwhelming that it felt like an unfinished sneeze – enjoyable, but not as enjoyable as it could have been. Talking about the commercial aspects of the film, I was very unimpressed with the less than subtle Keystone Bank brand placement. I know the Bank is a key sponsor of Chief Daddy but a whole scene about the Bank is a bit much don’t you think? The Johnny Walker and Airtel brand placements were subtle enough though. Not much of a Hollywood buff, so i am quite stingy with accolades, but this one gets my vote. It reminds me of ‘Oscar’ a Sylvester Stallone Comedy from the 90’s. Took place in just one day, A drama full of twists, turns and a barrel of laughs. So Hil, your review is spot on on every angle. Star studded cast…but they all had their roles cut out for them and they played each part to script. All comedians true to form. Paitience was extra impressive as the house manager. 3.Great contrast to his Boomclat of a Son (and yes Falz is officially a crazy fella and that song was annoying, yet funny and catchy..found my self humming to ” you must be madt!…. you must be madt! whose your dadt? He was my best actor, I think! 5.I liked the album scene with RMD and Chief Daddy, having all the other kids and the detail on each person showing, he actually had an actual relationship with them. 6.Loved the chemistry between Beverly and Dammie the footballer. It was fun reviewing this. Awesome stuff! I like your perspective. Thanks for dropping in on my blog. Send me a DM on any of my Social media pages so we can talk. Dear maveriq can I get a ticket to watch this movie please??? ?